The automatic selection of the current font is a feature that allows you to easily find out what font a particular word or text has just by selecting it or by positioning the cursor inside it. If a text section with more than one font applied (on different words) is selected, a font will no longer be displayed in the Font drop-down menu. When changing the font for a selection that has multiple fonts applied, the whole text will be set to have the new selected font. When a CSS style containing references to new fonts is imported into the document, those new styles will appear in the drop-down menu. The size change affects the selected text or the text entered afterwards, if no text selection has been made. By default, the text size is set to 14 pixels. 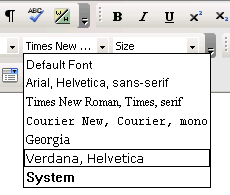 The text sizes are similar to the ones used by the most common word processors (Microsoft Word, OpenOffice). The current font size will be autoselected in the Size drop-down menu. To see what size a specific text is, simply select the text or click inside it, and then check out the font size drop-down menu. However, if a text selection has more than one font size applied, a certain size will no longer be displayed in the drop-down menu. 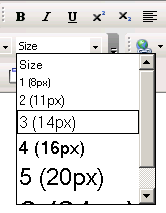 When changing the size of a text selection that has multiple sizes applied, they will all be replaced by the new size.